This is a sculpture I made for Sculpture II, '06 but didn't document till this weekend. 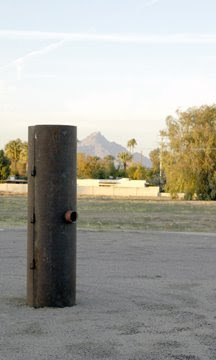 The piece was originally located outside of the Art building at ASU. This object was very out of place along the path, so to some, it became a curiosity. The object of this piece is to invite observation from passersby, and to also keep their attention for at least 6 seconds, double the average time a person will look at a piece of art.